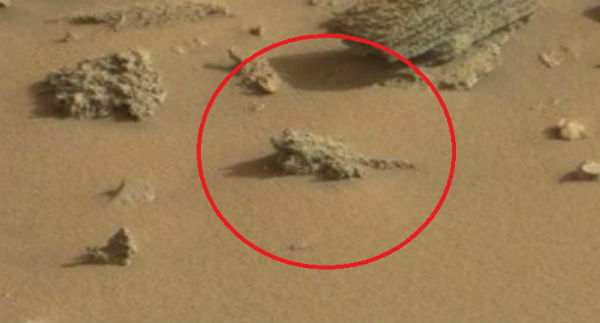 Was A Frog Spotted On Mars By NASA’s Curiosity Craft? UFO enthusiasts and space fanatics are always on the lookout for signs of alien life on other planets, and it seems their prayers may have been answered after cameras on NASA’s Curiosity rover captured what looks like a frog on Mars. International Business Times reports that UFO enthusiast Jason Hunter spotted the mysterious creature camouflaged amongst ancient rocks in an image published by NASA. Zoomed in, the object appears to have eyes, a wide mouth, a back and scaly-looking skin which show signs that it could be an alien amphibian or reptile. Hunter posted a video montage of the photograph to YouTube – accompanied by light-hearted folk sounding music – on September 30th. “This is a frog on Mars”, said Hunter. “The frog looks happy to me”. Scott Waring from UFO Sightings Daily, critically-acclaimed by Huffington Post as a blog site that posts ‘content on the greatest conspiracies in human history’, also agrees that the ‘sculpture’ looks like a frog and that the discovery could be something extraordinary. “He is correct in his assumption of saying it looks like a frog”, Waring wrote. “It is true that many animals including frogs have adapted to look like their environment, so yes it’s possible”. “There have been many discoveries on Mars of many creatures and ancient ruins”. And strangely, this is not the first time what appears to be an alien animal has been found on Mars. Hunter and other UFO enthusiasts have also spotted anomalies such as a rat, iguana, ‘martian flower’, as well as a fossilised finger, spine and thigh bone – but experts later detailed that the objects were simply rocks. But the extraterrestrial phenomenon could be brought on by pareidolia, a psychological experience involving illusions that a vague or random stimuli, usually sounds or images, are something much significant. The phenomenon is a type of apophenia, which involves seeing connections in meaning data. Examples of pareidolia are seeing the face of a man in the moon, the face of Jesus in a piece of toast (yes, it has happened). Therefore in this instance, the frog on Mars may simply be another rock but UFO enthusiasts, desperate for signs of extraterrestrial life to be found, may be seeing something a lot more significant for that purpose. However, the truth behind what the object is, still remains a mystery. David Waring suggests that it could in fact be a statue or sculpture that has been eroded and pitted by the wind and sand on the planet. Yet even though the signs seem to be pointing more towards the object actually being a rock, all may not be lost in the search for aliens, after last year NASA released a statement saying that after the analysis of a rock sample found on Mars, scientists discovered the sample was composed of organic materials essential for habitable life. “Scientists identified sulphur, nitrogen, hydrogen, oxygen, phosphorus and carbon – some of the key chemical ingredients for life”, said the statement. “A fundamental question for this mission is whether Mars could have supported a habitable environment”, explained lead scientist for NASA’s Mars Exploration Program Michael Meyer. “From what we know now, the answer is yes”.